U.L. 1008 Listed (File No. E32008), these Single Motor Automatic Transfer Switches are rated for applications of 100 to 600 amperes, up to 600 Vac with interrupting ratings of 35kAIC@480Vac thru 100kAIC@480Vac available. 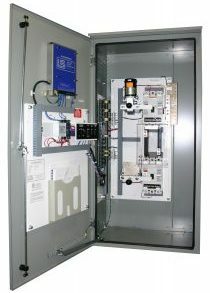 The Standard Single Motor Automatic Transfer Switch (ATS) utilizes and isolated motor to operate both the normal and emergency molded case units at the same time. Normally, the transfer switch operates on the preferred power source with the Normal molded case unit in the closed position and the Emergency molded case unit in the open position. For this unit, a “Neutral” or “OFF” position is not available and is not approved to be used as service entrance equipment. The Single Motor ATS provides dependable, positive, programmed delay transfer to an emergency power source in the event of normal power source failure. All ATS are protected by mechanical interlocking, located behind the molded case units, to prevent accidental paralleling of the sources. These ATS have mechanical barriers to isolate the operator(s) from any live parts when performing maintenance on the ATS. This helps improve their safety. They also come equipped with a manual operating handle located on the Normal Molded Case Unit to safely operate the transfer switch manually.